With a $1 million reward in place, a manhunt continued today for a fired Los Angeles Police Department officer suspected of killing two people in Irvine and a police officer in Riverside, although an LAPD tactical alert allowing supervisors to keep officers on duty past their shifts was lifted. Christopher Jordan Dorner, 33, was charged with capital murder today by Riverside County prosecutors for the Thursday morning shooting death of Riverside Police Officer Michael Crain. Dorner was also charged with three counts of attempted murder for the shooting of Crain’s partner and a shooting attack on two LAPD officers in Corona. One of the LAPD officers suffered a graze wound in that shooting, which occurred about 15-20 minutes before Crain and his partner were attacked, police said. The search for Dorner has been centered in recent days in the Big Bear area, where the former officer’s pickup truck was found burning Thursday afternoon. But according to a federal arrest warrant affidavit filed last week, U.S. authorities believe Dorner may have already fled to Mexico. The affidavit notes that Dorner’s truck was found near property owned in the Big Bear area by relatives of a known Dorner associate, who was spotted early Thursday afternoon in Costa Mesa. The affidavit also notes that Dorner’s “personal belongings, including his wallet and identification cards,” were found Thursday by San Diego police near the U.S.-Mexico border at the San Ysidro Port of Entry. On Feb. 3, Dorner allegedly gunned down the daughter and future son-in-law of the ex-police captain who represented him at a hearing that resulted in his dismissal from the LAPD. The bodies of 28-year-old college basketball coach Monica Quan and her fiance, 27-year-old Keith Lawrence, were found in Lawrence’s car in the parking structure of their Irvine condominium building. The next day, Dorner allegedly posted a 6,000-word manifesto on Facebook, vowing to kill named LAPD officers and their families. Fifty Los Angeles police officers and their families are being watched, authorities said. On Thursday, Dorner was allegedly involved in the shootout with Los Angeles police guarding an officer’s home in Corona, leaving an LAPD officer with a graze wound to the head, police said. About 20 minutes later, he allegedly fired on the pair of Riverside police officers stopped at a red light, killing Crain, 34, and wounding the other. The wounded officer was expected to recover. Crain, an 11-year department veteran, was a former Marine. He is survived by his wife, Regina, and two children, Ian, 10, and Kaitlyn, 4. 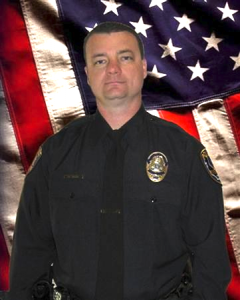 Crain left “an unforgettable impression” on everyone he met, Riverside police Lt. Guy Toussaint said. Crain’s funeral is set for Wednesday. LAPD Lt. Andy Neiman said this morning that hundreds of local, state and federal investigators have been sorting through more than 600 clues in their search for Dorner. A reported sighting at a Northridge home-improvement store on Sunday led to an hours-long search. Neiman urged anyone with information on Dorner’s possible whereabouts to call (213) 486-6860, or Crime Stoppers, (800) 222-TIPS. However, anyone seeing Dorner should call 911 immediately, Neiman said. The search for Dorner, meanwhile, continued to include the area around Big Bear, where his torched pickup truck was found Thursday, but it was scaled back. An LAPD tactical alert that had been in effect over the weekend was lifted about 7 this morning. However, motorcycle patrols remained suspended by the LAPD as a security measure, according to the department. “This is a man who has targeted those that we entrust to protect the public. This is not about capturing a suspect, this is about preventing a future attack, maybe a murder,” Beck said. Donors to the $1 million reward fund for information leading to Dorner’s arrest and conviction include police officer associations in Los Angeles, Riverside, San Diego, Irvine, Long Beach and the Port of Los Angeles. The Los Angeles Dodgers and entertainment conglomerate AEG contributed, as did United Firefighters of Los Angeles, the Association of Los Angeles County Sheriff’s Deputies, the FBI, First Watch, the City and County of Riverside and six anonymous donors, officials said.